This site is a dedication to the Lambretta three-wheeler. We have searched the world for Innocenti documentation, sales leaflets, manuals and parts information to produce this website. We have tried exceptionally hard not to make assumptions, stating only the facts as Innocenti intended. At the start of our Lambro journey we discovered that they are a largely untouched area of Lambretta’s history and so creating this website has been extremely exciting for us. The disadvantage to this has been that documents, parts and even Lambros themselves have not survived the test of time. 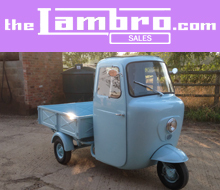 There are a few individuals who have always carried the Lambro flag and have alongside collecting Lambretta parts have collected Lambro parts that were available and kept them in anticipation of a revival. That time seems to be upon us. We have put this site together with the intention of providing technical information and as a portal to find everything you need to restore your vehicles to their former glory. Helping as many people as possible to restore and maintain their Lambros has been the driving force for this site and we hope you enjoy your Lambro journey as much as we do! 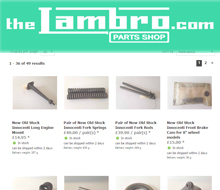 Buy parts for your Lambro and Lambretta three-wheeler on our online shop. We stock New Old Stock, remanufactured, reconditioned and used parts. Visit the Workshop Services of the shop to learn more about the services we can offer to you. 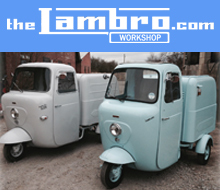 From full bare metal restorations to servicing, can provide you with the support required to get your Lambro on the road and keep it there. Whether you are looking for a restored Lambro or a project, you can find Lambros currently for sale and those which are coming up for sale in this section of the website. Lambros for sale are advertised here first!